Summer is not the time of year to be slaving over hot stoves when the guests are having pre-dinner drinks in the garden. This dish can be prepared earlier in the day and then just popped in the oven in the evening. To make the stuffing: Heat the butter and oil in a large frying pan. Add garlic and shallots and cook for 3 - 4 minutes until soft. Add spring onions and cook for 2 mins. Stir in bread-crumbs, purée. lemon juice, rind and parsley. Season well then allow to cool. Stir in egg. Preheat oven to 180°C/160°C, Fan/350°F/Gas Mark 4. Make a large rectangle of foil, approx 18 x 24 inches (45 x 60cm). Brush with the olive oil. Place half of the prosciutto slices side by side on the foil to make a rectangle. Place half the cod fillets, slightly overlapping, on top of the prosciutto. Spread the stuffing on the fish and cover with the remaining cod. Fold the ends of the prosciutto up. 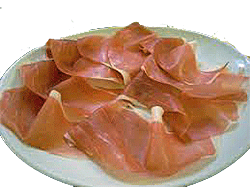 Top with the remaining prosciutto tucking ends underneath. Fold the tin foil over to form a firm, sealed parcel. Wrap in a second sheet of foil and place in the oven on a baking sheet for 20 mins. Fold back tin foil and brush the proscciuto with the honey. Increase oven temperature to 190°C/170°C, Fan/375°F/Gas Mark 5. Return to the oven and bake for 25 - 30 mins until the proscciuto is crispy. Remove from oven and gently transfer to a serving dish.